It is not secret that I have long thought that James Comey must be terminated as Director of the FBI. See my previous blogs from November 14, January 22, and May 3. His grave errors of judgment last year single-handedly threw the election to Donald Trump, the most unstable, mean-spirited and incompetent President in the history of our great country. I was therefore elated with the news this week that Comey had been fired. I was invited to speak on CNN International in two segments ( 1, 2) on Tuesday, and was obviously gleeful. But it turns out I was just about the only Democrat who was truly happy with the news. Almost instantaneously, Democratic politicians and commentators flooded the airways with statements denouncing the President’s dismissal of Comey. I felt, and still feel, that this reflexive “if he’s for it, I’m against it” response was misguided, both on the merits and as a matter of politics. First, on the merits. While between segments on CNN I got in a heated debate in the green room with former FBI agent Steve Moore, although I had largely agreed with him in our segment a few minutes earlier. Our disagreement was over his contention that Hillary Clinton should have been prosecuted. That belief, which prevails overwhelmingly in Republican and even some Democratic circles, is completely indefensible. The reason is that the law that Clinton was accused of violating, 18 U.S.C. 793 (e) and (f) of the Espionage Act, does not apply to the facts. As former military prosecutor and current U.S. Army Judge Advocate John Ford has explained, the law was designed to combat German espionage during World War I and has been narrowly interpreted since that time. In a 1941 US Supreme Court case, Gorin v. U.S., the law was interpreted to require a bad faith intent to benefit a foreign power and damage the national defense. The Espionage Act has been used only sparingly in the most egregious spying cases. But an even closer look at the statute reveals a further problem in this particular case: there is no parsing of the law that can possibly apply simply to sending, receiving or storing e-mails on a private server, activities no one ever imagined when the law was drafted 100 years ago. If you saw the film Snowden last year, you saw Joseph Gordon-Levitt as Snowden put a bunch of data on a usb drive at work and sneak it out of the top-secret compound in a Rubik’s cube. That’s the type of “removal” that the Espionage Act is designed to prosecute. You physically take something away from one place and put it somewhere else. But that’s never been what Hillary Clinton did. Sending and receiving e-mails and storing them on a hard drive is not “removal from its proper place of custody.” I think most people will agree that receiving and storing are not “removal,” but let me also explain why sending an e-mail is not removal. When an e-mail is sent, a new object is created for transmission and nothing is taken away. What could be the “proper place of custody” from which the e-mail is “removed?” The clause simply makes no sense in the context of sending an e-mail, which is not surprising given that it was drafted 100 years ago. Sending an e-mail is a transmission, which is covered by the next clause “delivered to anyone in violation of his trust” and separately by section 793(e), which requires that the recipient be unauthorized. No one has ever alleged that any of the relatively few e-mails found on Clinton’s server that were marked classified were delivered to people who were not cleared to see them. So really there is no honest reading of the Espionage Act that would criminalize what Hillary Clinton did, which was using a private server to send, receive and store e-mails. As many have pointed out, what she did may have violated State Department rules, but no criminal statutes. There never was any chance that the FBI would find evidence that would lead to any criminal conviction. And yet Comey, in violation of long-standing FBI and Justice Department practices, pretended that evidence of criminality was “probable” when he authorized his officers to obtain a search warrant on October 30. He further violated policy by making sure that the search would be made public (although filed under seal) when he sent his October 28 letter to Congress. 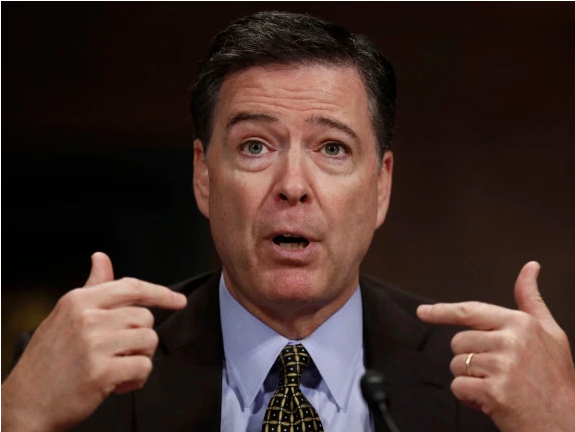 When a junior lawyer in his office questioned whether it was right to risk interfering with an election, Comey wrongly answered that he would not even consider that possibility, even though the Hatch Act and long-standing policies required the avoidance of interference. Six months later, he told the Senate that he would do it again. Last week, Comey justified his actions by admitting that he wanted to see e-mails from the period prior to the establishment of the server, supposedly because he thought those related to Clinton’s intent. Intent to do what? He’s never explained that. Clinton wasn’t prosecutable simply because the FBI didn’t have, in Comey’s own words, a “golden e-mail” proving she intended to do something wrong. She wasn’t prosecutable because the law did not proscribe what she did, regardless of her intent. This long-winded explanation goes to why I was so happy to hear that Comey was fired. He had revealed himself to be someone who could not properly interpret the law, even in the most significant, high profile case. And even after having six months to reflect on what he did, he said he would do it again. He had to go. That my view was the unanimous view of the Justice Department was evidenced by the memo dated May 9 by Rod Rosenstein, the new Deputy Attorney General who had been approved by the Senate 94-6 just two weeks earlier. In his memo, Rosenstein states “Almost everyone agrees that the Director made serious mistakes; it is one of the few issues that unites people of diverse perspectives.” Rosenstein takes Comey to task for his July 5 press conference discussing the decision not to prosecute Clinton (which apparently was made weeks before). “It is not the function of the Director to make such an announcement.” Quoting a litany of statements by former Deputy Attorneys General, Rosenstein also finds Comey’s actions in October to be severely problematic and “antithetical to the interests of justice.” Rosenstein’s conclusion is that “the FBI is unlikely to regain public and congressional trust until it has a Director who understands the gravity of the mistakes and pledges never to repeat them. Having refused to admit his errors, the Director cannot be expected to implement the necessary corrective actions.” In other words, Rosenstein told Trump he had no objection to firing Comey. Some have criticized the conclusory nature of Rosenstein’s letter, but more details wouldn’t have made it nicer to Comey, only worse. Comey’s decision-making seems to have been driven by a desire to appear impartial. I’ve seen a lot of people, even judges, make this mistake. The law often requires officials to avoid the appearance of impropriety or partiality. But that is not a license to do actually improper things, in the hopes of appearing neutral and fair. This was Comey’s mistake. He consistently behaved as though he was compelled to do the wrong thing, in order to create the appearance of doing the right thing. In July, to avoid mounting criticism of the FBI after Bill Clinton’s meeting with Loretta Lynch, he wrongly held a press conference in which he tried to lay out a case against Hillary Clinton while at the same time supporting the decision (made weeks earlier) not to prosecute. In October, he wrongly notified Congress of a further investigation of e-mails before anything significant was found, because he worried that he would be criticized later for “concealing” the fact that they were conducting a new search. In both cases, he decided to do the wrong thing to improve his reputation for neutrality, rather than do the right thing and take unfair criticism. Mistakes happen and can be forgiven if they are accepted, but it is clear from Rosenstein’s memo that Comey could not ever be expected to understand that he had made a mistake. Rosenstein must have been as infuriated as I was at Comey’s May 3 testimony. It didn’t help Comey that on many critical details, he got the facts wrong. On the morning before he was fired, the FBI submitted a correction to the Senate, explaining that Comey was mistaken when he suggested that Huma Abedin had forwarded hundreds of thousands of e-mails to the e-mail address of her husband Anthony Weiner. In fact, only a handful had been manually forwarded. Comey’s behavior had simply become indefensible. I never thought that Trump would actually get rid of Comey. After all, that would imply that Comey did something wrong in the lead-up to the election which he won. Since it is increasingly clear beyond any reasonable doubt that Comey’s actions swayed the election to Trump, why would Trump risk feeding the narrative that his election was illegitimate by terminating Comey? I didn’t think he would do it. But he did, and so I was happy, happy, happy. The culprit who cost Clinton the election, and said he would do it again, was gone. What could be bad about that? Apparently, that isn’t how most Democrats saw it. No sooner was the firing made public, when Democratic politicians began lambasting Trump for his decision, and backing off their prior antagonism towards Comey. There have been several criticisms, some certainly fair. First, no one believed the initial claim that Trump had fired Comey simply because Rosenstein had said it was the right thing to do. That’s not how Trump operates. Everyone suspected, I am sure correctly, that Trump had other motives, including a desire to stop Comey from talking about the investigation of the Trump campaign’s possible ties to Russian interference in the election. For me, it doesn’t really matter what Trump’s motives were. He’s insane. Just because he wants something to happen doesn’t mean he’s going to get what he wants. His actions are just as likely to backfire and produce the opposite result. So firing Comey wasn’t a bad thing because Trump wanted to interfere with the Russia investigation, unless it actually would interfere. And I don’t think it would. First, I start from the point of having no confidence in the FBI actually finding any evidence of collusion between the Trump campaign and Russia, at least not at the level that would make a difference to anyone. We already know that Trump is nuts and that his campaign was filled with wackos with all sorts of bizarre backgrounds. That even a dozen of them were paid Russian agents wouldn’t make a difference to the people who voted for him, or their Republican enablers in Congress. Russia certainly was involved in espionage and propaganda aimed at defeating Clinton, and some of it was effective. But that is not what cost Clinton the election. She was well on her way to winning before Comey stepped in and ruined everything by making enough people believe she was going to be indicted. Comey is the real villain of the story, not Russia. Russia was a side show. That Trump and his campaign team were aligned and conspiring with other bad people who wanted Clinton to lose isn’t going to change the calculation one bit. Second, Comey was the director of the FBI, which means he was the figurehead, the one making big decisions, but not anywhere near the agents who are actually doing the investigating. Those folks are 3 or 4 rungs down the ladder. Removing Comey won’t affect their job one bit. If they are really investigating, they will continue. Because of the pervasive anti-Clinton (and hence pro-Trump) attitude at the FBI, my guess is that there is not much investigating going on. After all, and this was one source of my argument with Steve Moore, if the FBI wanted to find something to prosecute against Trump, they’ve had plenty of time and more than enough opportunity. It’s not like there is a dearth of allegations of wrongdoing out there. For example, what’s up with the $25k bribe he paid illegally from his charitable fund to Pam Bondi? If the FBI wanted to nail Trump, they could have done it years ago. But they don’t. And that’s the big point. The FBI likes to pretend that it is neutral and impartial but it isn’t. They aren’t robots sitting on a corner just waiting for crimes to pass by so they can enforce them. There are potentially millions of crimes to investigate, and agents and offices have to pick and choose where to spend their time, and that choice is the definition of politics. So I wouldn’t be holding my breath waiting for the FBI to come up with the goods on Trump. Whether Comey or someone else comes in to run the place, that investigation is likely going nowhere, because removing Trump from office is not what the rank and file wants. Compare that to the “moving heaven and earth” that Comey described with the Clinton e-mail investigation where they searched day and night for something that was never going to be there in the first place. Still, the Democrats in Congress had to act all concerned that Comey’s removal would impede the Trump-Russia investigation and that was the story that got a lot of play for the next few days. The President and others quickly recognized this as a hypocritical about-face, and that has largely worked to deflect the attack. Did the Democrats really want Comey to still be FBI director, just because they hoped he would redeem himself by nailing Trump? That strikes me as borderline insane, given what we know about Comey. I think the opposite is more likely true. If there is any chance at all of the Trump-Russia investigation becoming significant, that chance is far greater without the self-interested shenanigans of an already discredited FBI director. Some worry that Trump will be able to control the investigation by naming a new director. Perhaps, but that will take time, because the new director has to be confirmed by the Senate. If the new director is seen as a partisan hack, the Democrats will likely be able to make a lot of inroads attacking him. If they can do that enough to win back the House in 2018, then they can conduct their own investigation. If the new director is someone fair who has not made the fatal errors Comey did and promised to make again, then we’re all better off. Either way, it’s a win. My initial reaction was that Rosenstein was now going to be in charge of the Trump-Russia investigation and that could only be a good thing. With Attorney General Jeff Session having recused himself, the decision-making falls to Rosenstein, a career Justice Department official, on that matter. Rosenstein clearly needed to have Comey out of the way, as Comey had proved to everyone that he would do whatever he wanted, regardless of what the Attorney General decided. Now that problem is gone, and Rosenstein can try to get the FBI to do a proper investigation. Until this week, everyone considered Rosenstein a stand-up guy. Now that has all changed. Even some of his so-called friends are calling for him to resign. I am not at all convinced that Rosenstein is a bad actor. It is certainly possible that I am wrong. After all, Trump nominated him, so that’s one big strike against him. But there are plenty of indications he’s a straight-shooter, and his memo supporting the removal of Comey is one of them. Some see it the other way, that he is an enabler who helped Trump remove the person he feared would lead the investigation that might result in impeachment. To believe that, you have to believe a few things that I don’t. First you have to believe that Trump is smart and has a plan. Second you have to believe that Comey is honest and would succeed in exposing Trump. If, like me, you don’t believe either of those things, then there is a more positive way to look at Rosenstein. Comey was a cancer that needed to be removed for the Department of Justice to function properly. Rosenstein took advantage of a moment when his interest in removing Comey coincided with Trump’s interest in getting rid of the guy talking about the Russia investigation to Congress. That’s how things get done in any bureaucracy. It’s not enough for the boss or the staff alone to want something. Things happen only when they both want the same thing. So, to me, it doesn’t really matter whether you want to say Trump had a design to remove Comey. He couldn’t get it done without the Department of Justice, and they couldn’t get it done without Trump. So, just as it is wrong to suggest that Rosenstein engineered Comey’s removal, it is wrong to suggest that Trump did it. They worked together, and likely for different reasons. We’ll have to wait and see if Rosenstein continues to maintain control of the Trump-Russia investigation or if he agrees to recommend the appointment of a special counsel, as many have demanded. One reason I was very happy on Tuesday was that Comey’s removal made the appointment of the special prosecutor much, much more likely. It never was going to happen while Mr. Faux-Neutral Comey was around. An independent special counsel is probably the only possible way that any criminal indictments will come from the Trump-Russia investigation, and it is also the only thing that might lead to impeachment. I don’t consider that likely, but on Monday, it was an impossibility. Today, post-Comey, there’s a glimmer of hope. When I began writing about Comey in November, I called for an investigation of the FBI and I think that is still necessary. Comey testified on May 3 that he had a meeting in his office on October 27 when he and his colleagues decided “unanimously” to send that inane October 28 letter that ruined the election. That’s a conspiracy to interfere with an election and I think the American people deserve to know who else was involved. Comey no doubt has a lot of supporters at the FBI. You’ll notice that we haven’t heard from any who wanted Comey gone. They were leaking and spinning madly in his favor before the firing and have continued to do so as they try to save their skins. The press doesn’t like to bite the hand that feeds it, so many of Comey’s supporters and their misdeeds have not been reported yet. My hope is that Inspector General Michael Horowitz will uncover what happened. He told Michael Isikoff that his report won’t be finished before the end of the year. It should be easy to ferret out the bad apples. Just ask them whether they think Comey was correct to send his October 28 letter. Any agent who still does has to go. It’s a common thing when you don’t have a good argument on the merits to argue the process. That’s a lot of the noise that is coming out this week in Comey’s defense. Sure, Trump could have waited to fire him face to face, or after giving him a chance to respond, but I’m glad he didn’t. If he had, Comey might have talked him out of it and then we’d be stuck with him for good. Trump could have handled the messaging after the firing better, but he didn’t, because he never does. There’s no painless way to fire an FBI director, no playbook for how to do it. Trump’s way was classless and clueless for sure, but that’s what he is. And for me, it’s another win, because it gives people something more to complain about. Trump’s approval ratings dropped to record lows this week. As I said, this whole Comey thing has been a big WIn-Win-Win. The Cover story is that Comey was fired because he never filed charges against Hillary Clinton. The undercover story is that Comey asked for more money for more FBI personnel so he could accelerate the Russia Investigation. westernwhere on Comey, Comey, and more Comey! DailyPUMA on Comey, Comey, and more Comey!